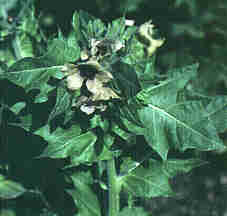 Henbane is a herb that has been used for a very long time both as a medicinal plant and for witchcraft. It contains very potent and poisonous alkaloids, hyoscyamine and scopolamine, which are similar to atropine, both in structure and effects. Eating the plant causes dryness in the mouth, thirst, enlarged pupils, facial redness, fever, palpitations and hallucinations. These symptoms can last for several days.